Empty spaces within the smile due to missing teeth can negatively impact your confidence. Reasons for tooth loss can vary, from unforeseen trauma to decay and necessary extraction, but dental implants comprehensively replace lost teeth. Our Portland dentist provides implant restorations that allow you to regain full functionality of your bite, maintain the health of your existing teeth and jawbone, and achieve a rejuvenated appearance. Our Portland dental team takes a gentle approach to patient care, ensuring each patient is comfortable and well-informed about their treatment. Implant-supported restorations are one of the best teeth replacement options available. They substitute a natural tooth from root to crown and are surgically placed into the jaw, preserving bone density. After placement, the implant post and surrounding tissue fuse, creating a strong foundation for the restoration. As the implant doesn’t move within the bone, this stable option completely restores your ability to chew as compared to a traditional, removable appliance. When you choose implant placement, surrounding teeth do not shift due to empty spaces in your smile. This maintains proper alignment and decreases the likelihood of future issues developing that would need further intervention. Our professional staff provides patients with personalized care, conducting an initial consultation and an exam before proceeding with treatment. This allows Dr. Carothers to determine if dental implants are an ideal solution at the moment or if you require preoperatory procedures to meet the oral health standards that support lasting results. Patients who are excellent candidates for implants have sufficient jawbone density and show no signs of periodontal disease. To begin your implant treatment plan, you will be thoroughly informed about all steps of the process. Dr. Carothers works closely with a trusted local oral surgeon and has collaborated with this specialist for over twenty years to ensure effective treatment results for our patients. 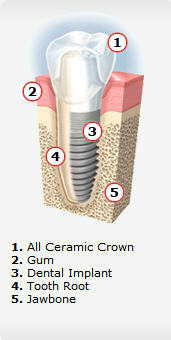 The restorations added to dental implants are fabricated from ceramic to seamlessly blend in with neighboring teeth. Dr. Carothers makes sure to create individual plans for each patient, helping them achieve the smiles they wish to have. Our mission is to achieve the best result through comprehensive care. Regain a Complete, Healthy Smile! If you have missing teeth and would like more information about dental implants, contact Dr. David N. Carothers and his capable staff to schedule your consultation. Call our practice today!